Added by Andy Hargreaves on July 27, 2011. Whether you fancy yourself as a Shakespeare, Arthur Miller or Mike Leigh, you’ve got a chance to write a play that will be performed by St Mary’s Theatre Club, through an innovative challenge launched by Jenny Byers. Jenny is giving up to 15 writers the chance to have their work publicly performed by local actors at the end of March. 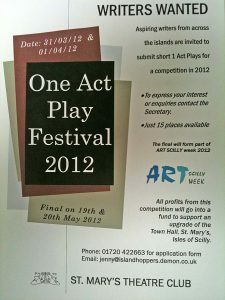 A mainland assessor will score the plays with the best battling it out at the Art Scilly event in May. The plays could be fully acted out on stage or could be performed as a ‘rehearsed read’ – the cast run through the piece beforehand but still use a script on the Town Hall stage. Jenny hopes that a small entry fee from each applicant will go some way to upgrading facilities for drama sessions at the Town Hall. The play must be suitable for a family audience, no longer than 50 minutes and they won’t be able to allow smoking or pyrotechnics.